Sunny Queen Meal Solutions is the food service arm of Queensland egg producer, Sunny Queen. Earlier in 2017, Sunny Queen opened a $40 million plant in Queensland to manufacture pre-made egg products for cafes, caters and restaurants. The new finger food range is designed to provide an alternative to traditional finger food whilst catering to different dietary needs. 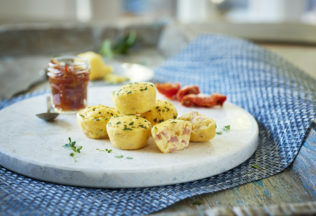 A number of options and flavours are available in the range including smoked ham and cheddar, fetta and Spinach and caramelised onion & parmesan egg bites, or corn and cheese, corn, caramelised onion & parmesan and Spanish with chorizo mini fritters. All options are gluten free and are frozen to provide a 12-month shelf life. The range can be prepared with a microwave, grill, hotplate or conventional oven. Sunny Queen Managing Director, John O’Hara, said there are an increasing number of events which require healthier food options. “Party pies and spring rolls no longer meet all customer demands or suit all occasions,” O’Hara said. McKenzie’s Foods is launching three new products in time for Spring.